It’s been several hours now since the welterweight fight between Floyd Mayweather Jr. and Victor Ortiz ended and I still don’t know what to make of it. 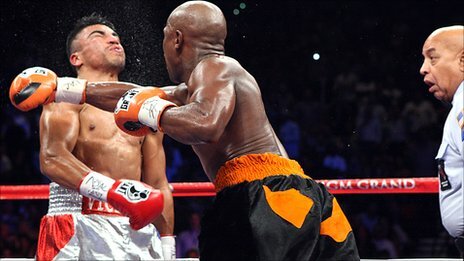 I’m still very puzzled as to why Mayweather behaved the way he did in the ring tonight. I’m even more perplexed by the sheer volume of journalists and regular people who have justified his actions via social media. I understand that Ortiz head-butted Floyd and it was one of the more vicious head-butts I have ever seen, however, I can not justify Floyd’s cheap knock out of Ortiz on a left hook right hand combination that followed. And hey I understand the rules; “Protect yourself at all times” but to feign as if you are accepting someone’s apology by giving them a hug then taking a quick step back and unloading on them is just trashy. This is boxing. This is not a fight between two inmates in a maximum security prison, or between two drunken college students in a bar. As a fan of the sport I expect a fighter to have a certain amount of class, and I expect for one of the greatest fighters of my generation to show some professionalism. Referee Joe “Fair but Firm” Cortez had already taken away a point for Ortiz’ egregious foul so I figured Floyd Mayweather, who was already seemingly well on his way to a unanimous decision victory, would appreciate his ruling and get back to work. But Mayweather failed me. He failed the sport of boxing and he failed himself. I’m really disturbed by what “Money May” did tonight. Tonight he lost at least one fan.